3. Offer options and get informed consent: The PCP should list the appropriate and available options. The benefits, costs and risks of each option should be described and questions answered. The patient and provider should then choose the best option, and the provider should obtain informed consent for treatment. After the available diagnostic evaluation has been completed, the couple's choices are to wait without treatment, to utilize basic treatment available locally or at the intermediate care level, or to ask for referral to a higher level for treatment. Waiting without treatment is not hopeless. 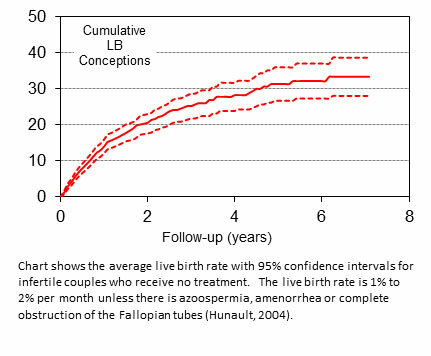 In a summary of three follow-up studies of infertile couples who did not receive treatment, the average likelihood of pregnancy leading to a live birth, was 15% at one year and over 30% at 5 years. (Hunault, 2004) (See Figure below). For an individual couple, the prognosis without treatment can be estimated from a complex prediction model generated in that study. More simply, a couple's expected prognosis also can be approximated from numbers based on the same model. The 20% average pregnancy rate is increased by about 1% for each year of female age under 30 years, increased by about 5% if the duration of infertility is less than three years, and increased by about 8% if the couple have secondary infertility.